Free Shipping Included! Carbquik Baking Mix, 3 Lbs (2 Pack) by Carbquik at Good Time Donuts. MPN: 2O-B04C-61KP. Hurry! Limited time offer. Offer valid only while supplies last. 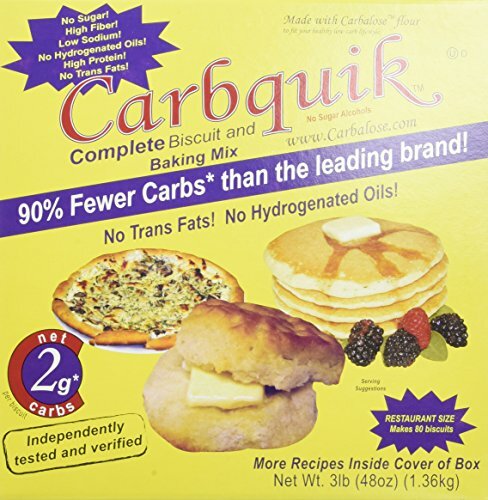 CarbquikTM Baking Mix is a revolutionary baking mix for everyone counting carbs. It's made from wheat so it tastes like flour with 90% less carbs! CarbquikTM Baking Mix is a revolutionary baking mix for everyone counting carbs. It's made from wheat so it tastes like flour with 90% less carbs! Most low-carb bake mixes are made from soy, giving them gritty textures and soy aftertastes. Since CarbquikTM is made from wheat, products made with it taste just like products made using flour or other bake mixes. It's even lower in sodium and calories than the leading full-carb mix! If you have any questions about this product by Carbquik, contact us by completing and submitting the form below. If you are looking for a specif part number, please include it with your message.